These healthy no bake cookies take less than 10 minutes to whip up and are a delicious snack idea! They are also gluten free, vegan and have an allergen-friendly option too! G’day everyone- My name is Arman and I’m the blogger behind The Big Man’s World. I’m born and bred in Australia but have recently moved to America. I’m stoked to have joined the Super Healthy Kid’s team to share healthy recipes without sacrificing on taste! With school and college just around the corner for many out there, having sensible snacks on hand is a essential to boost productivity and also keep them energised and their minds working. 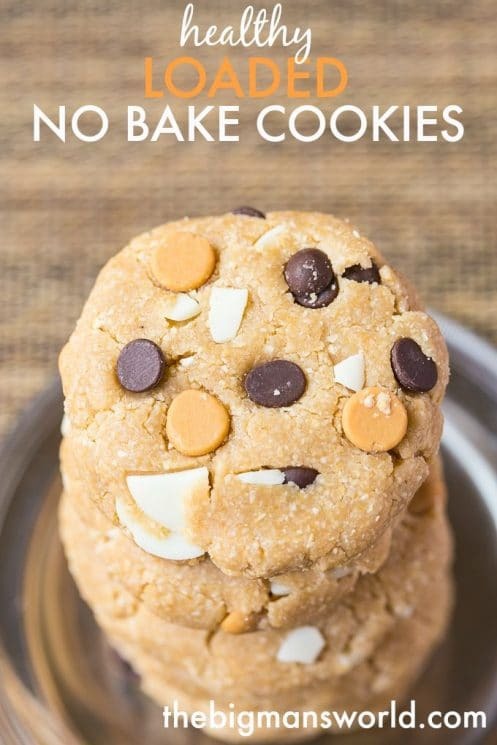 No bake snacks are the perfect solution because they take barely any time to whip up and can be customised to suit various tastebuds and to keep things creative! One of my all time favourite snacks I make on a weekly basis are my no bake white chocolate raspberry cookies. 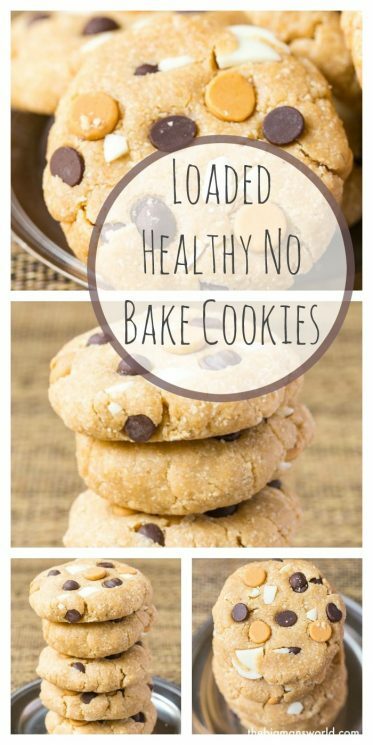 These cookies are a healthy, sweet snack that pack nutrition and satisfy my hunger between meals. 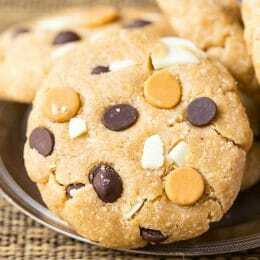 Growing up, one of my favourite cookies were these loaded oatmeal cookies topped with a mix of chocolate chips- White, dark, milk and peanut butter. I decided to recreate this in a delicious and easy no bake form today! 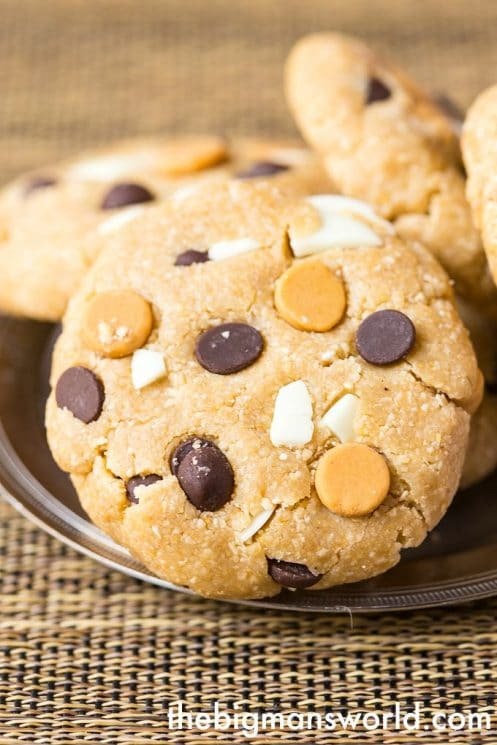 These loaded no bake cookies are a winner! The base is made from oat flour, nut butter, brown rice syrup and a little bit of dairy free milk to form together. Then comes the fun part- The toppings! For those with nut allergies, this works really well with Sunflower seed butter or soy nut butter. Also, for those who don’t have access to brown rice syrup, you can definitely use honey or another sticky sweetener. Be sure to increase it by around 1-2 tablespoons. Thanks once again to Natalie and Amy for this opportunity! I cannot wait to share more delicious, healthy recipes with you all! Stop on over my blog or say Hi on Facebook– I’d love to be friends! Line a large plate or baking tray with baking paper and set aside. In a large mixing bowl, combine the oat flour, gluten free quick oats or oat bran, and sea salt and mix well. In a small microwave safe bowl, combine the nut butter (Of your choice. 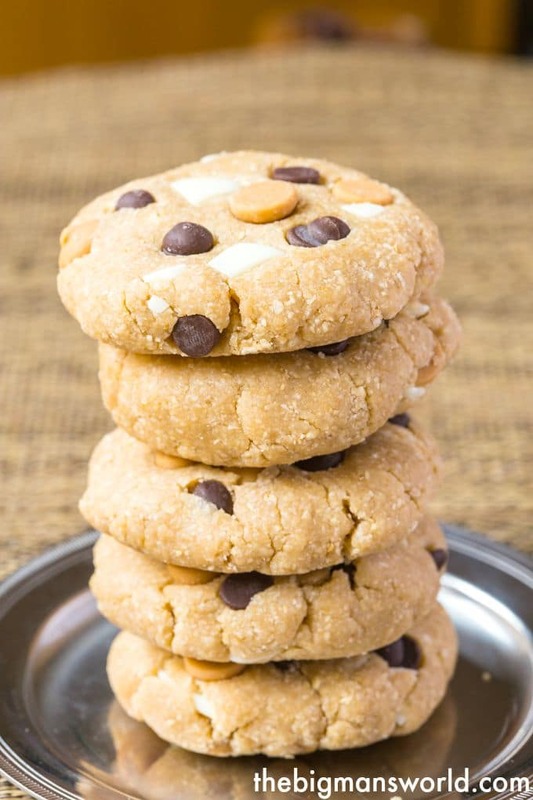 For an allergen free option, use sunflower seed or soy nut butter) and liquid sweetener and heat until melted. Pour the liquid mixture into the oat mixture and mix very well. If the mixture is too crumbly, add dairy free milk, a tablespoon at a time until a thick batter is formed. If mixture is too wet, add more oat flour until a thick batter is formed. Form into small balls and press onto the lined plate and press into a cookie shape. Add the chocolate chip (I used dark, milk and white dairy free chips) mixture on top and press firmly into the cookies to set. Refrigerate for at least 30 minutes to firm up. Could you use coconut flour instead of the oat flour? When do we add the oats? Same time as the oat flour? Hi Holly! Apologies for the delayed reply! I do apologise for the oversight- That is correct- Add them at the same time! I would just like to say thank you so much for providing a no-nut alternative in this recipe! My daughter has a very severe nut allergy so I make everything from scratch and feel so frustrated that nearly every healthy recipe features nuts with no suggestions for nut allergy sufferers. Brilliant job hurray! The nutrition Fact – what serving size are those numbers based on?